Unless you’re building a custom application for yourself, sooner or later you’ll encounter feedback from users. It may be that your site is not always available, a task which is difficult to complete, or a piece of content that is not very inclusive. By listening to them, your web site is more useful in the long run. 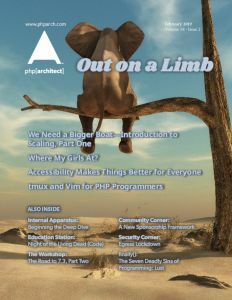 This issue collects articles to help your servers scale, improve site accessibility, find and replace old and unused code, and more. Scaling can be a tricky subject. We’re often warned against scaling too soon but left too late, and the results can be just as bad. The need to scale comes from an application being successful—so if you are in that situation, then congratulations! In this first part, we’ll cover how to know when its time to scale and ways to scale your web and PHP application servers. I had a rough day at work on Friday. I want to share with the PHP community what made it rough, what I have learned about being in a male-dominated industry, and how I have worked with my coworkers to minimize the rough days. Accessibility is a broad concept that covers many ideas and requirements, and your project needs accessibility for many varied reasons. Perhaps you are required to comply with accessibility laws and regulations. Perhaps you have existing users complaining that your services are difficult to use. Maybe you are looking to attract a larger, more diverse audience or are just interested in making sure your website works for all people. No matter your reasons for starting, improving accessibility is about increasing the number of people who can use your site or app, and that’s a good thing for everyone. IDEs are great. Whether its CodeIgniter, PhpStorm, or something more enterprise-level like Eclipse, they all have their benefits. What would you do if you don’t have access to your IDE of choice and need to update code? I’ll introduce you to tmux and Vim; these two staples of the *nix universe can be a lifesaver. Legacy code is an unfortunate fact every developer has to face. Whether you subscribe to the idea that legacy code is just inherited code, untested code, or that it’s code which has reached a certain age, the grim reality of software development is that code lives, for a very long time. See how to tombstone your application to find dead code. Understanding C code requires far more than understanding the language syntax—we need to understand the environment and context. Along the way, we’ll learn more about how computers work. We’ll be taking a deep dive into how PHP implements arrays. We begin our deep dive this month by looking at the PHP executable file and PHP’s packed hash table. As we return to our discussion of the deadly sins of programming, we find ourselves ready to talk about lust. After all, this is February, a month known for that term. Wait, how does lust relate to programming? Well, to get to the bottom of that we need to look at older definitions of lust. Then it often just referred to “intense longing” for anything that you desire.